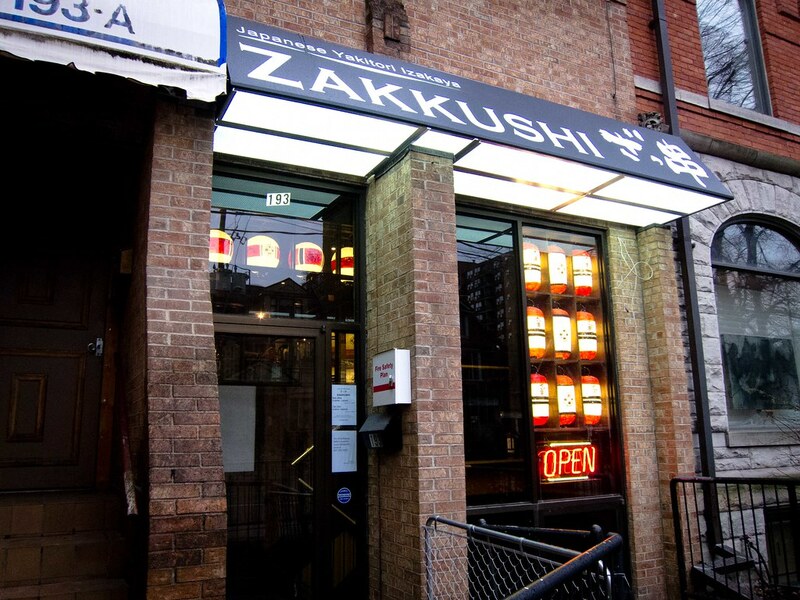 Zakkushi is another new Toronto restaurant with origins from the West coast specializing in yakitori (different meats/veggies skewers grilled on a Japanese Charcoal). 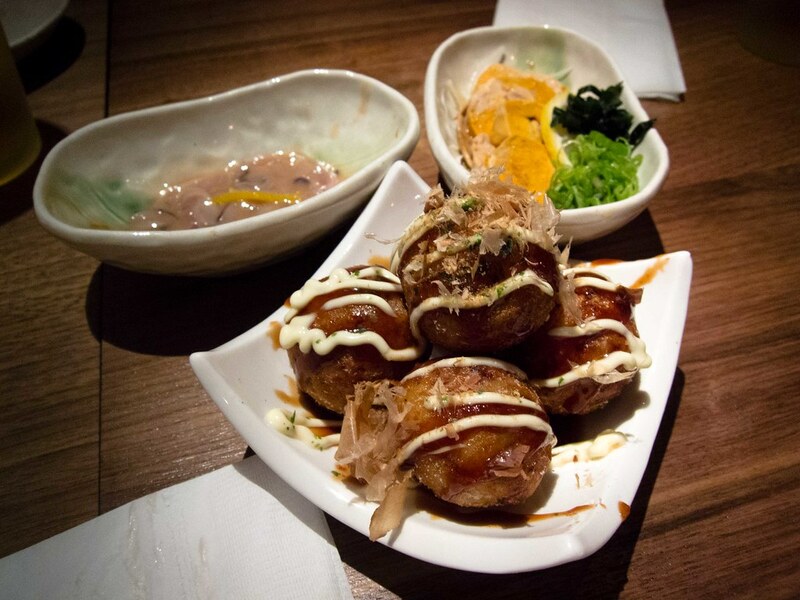 We rounded up a group of people to visit, thus maximizing the number of dishes that could be sampled. 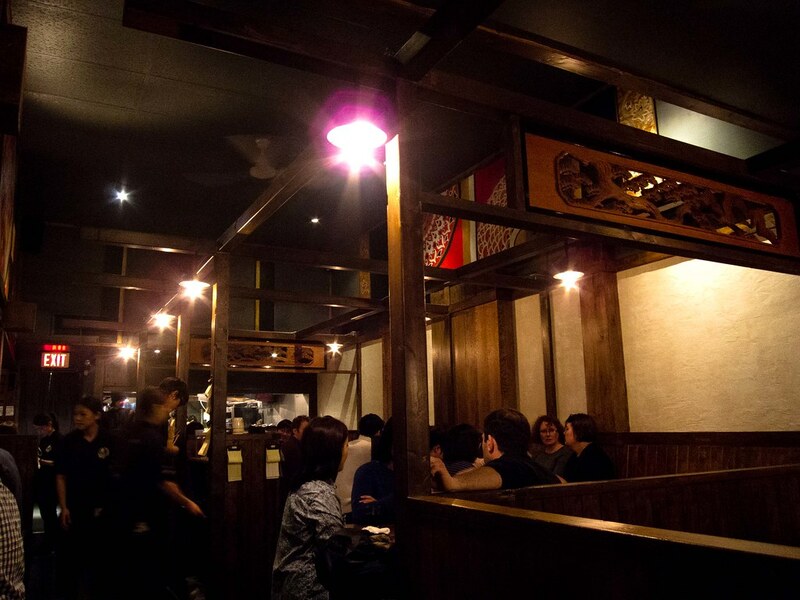 Atmosphere: Inside the restaurant, it felt very much like eating at a food stall or market in Japan. There were many large booths, and the energy and volume was high. Servers rushed around and the smell of fresh grilled meat wafted through the dining area. 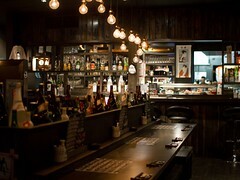 With the help of their high ceilings, the room wasn’t smoky at all. It was a great mood for beer and loud conversations. Service: Food arrived quickly. 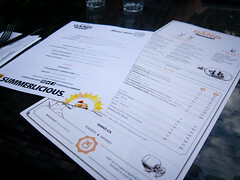 With the high number of menu items, the server punches in the order and hangs a print out next to each table. We were able to easily keep track of what dishes we’d tried and what was still to come. Everything felt efficient and we were always able to flag down someone as required. Food: We ordered a lot of food, plus two pitchers of beer (split between six people) and a $60 bottle of sake (split between three people). 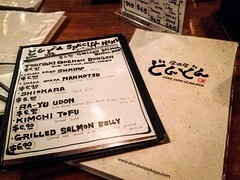 So although our bill came up to ~$60/person the meal was well worth the cost and a great price. 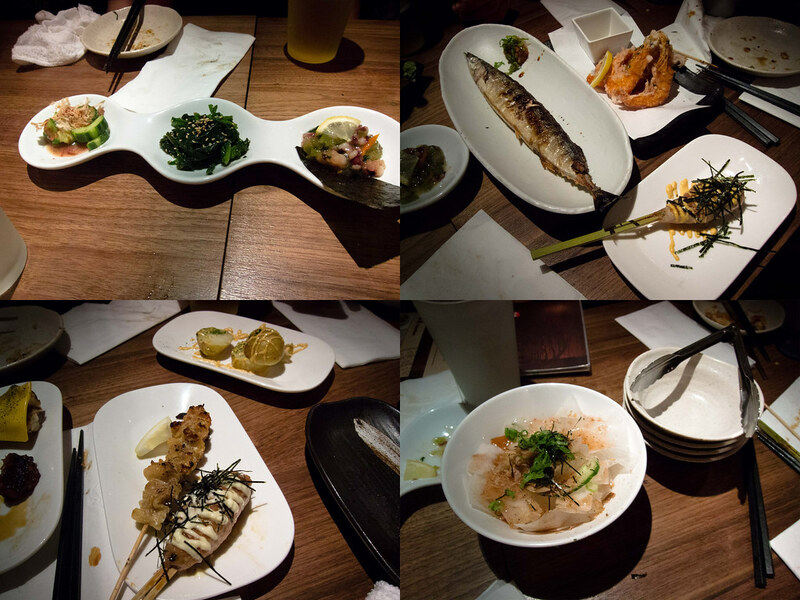 For appetizers, we tried the appetizer sampler of takowasabi, marinated cucumbers and goma-ae (spinach with sesame sauce) and a full order of shiokara (marinated squid with special sauce). 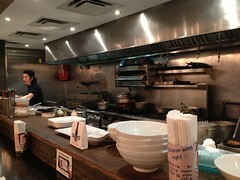 All of the dishes were pretty standard except for the shiokara which split our table in like or strongly dislike. I enjoyed the dish, but it is very salty and very fishy, so beware. As each skewer arrived, it was disassembled to allow everyone to have a bite. Since we pretty much ordered every type of skewer, I’ll just highlight my favourite ones of the night. 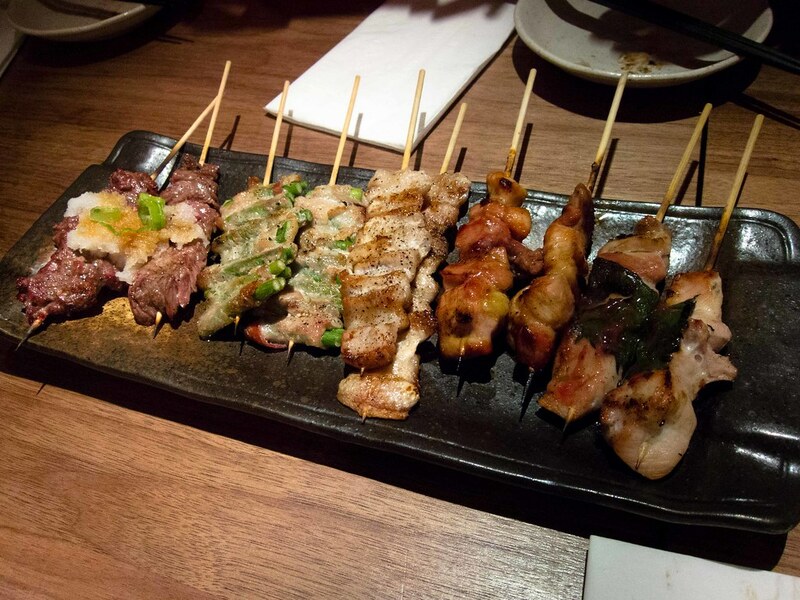 The p-toro (crunchy and juicy pork) and kawa (chicken skin) are must tries, both were grilled to a crisp and juicy. I also really liked the chicken gizzard, which was tender and a great chewy texture. 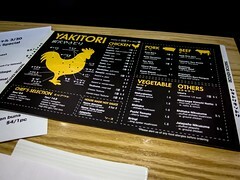 None of the beef or vegetable yakitori really stood out for me in terms of flavour. 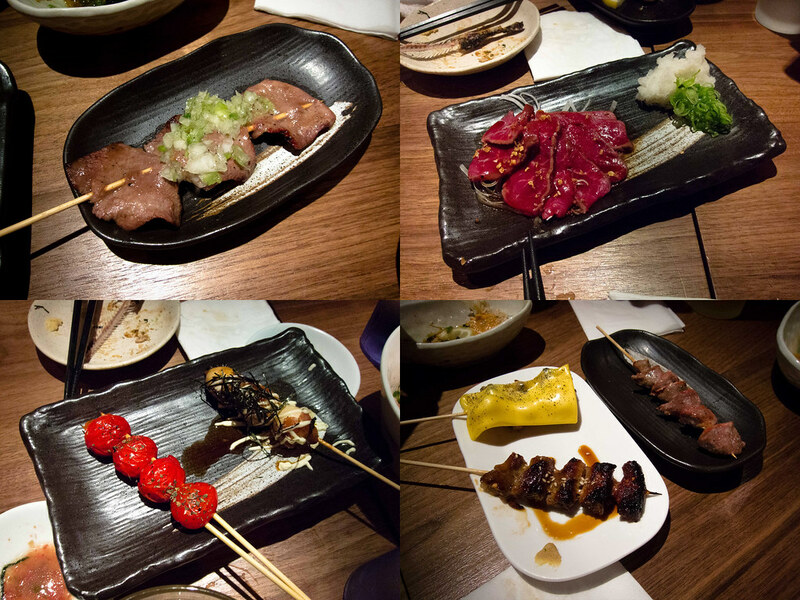 I would start with ordering the Zakkushi set, which comes with 5 types of skewers covering each meat group. 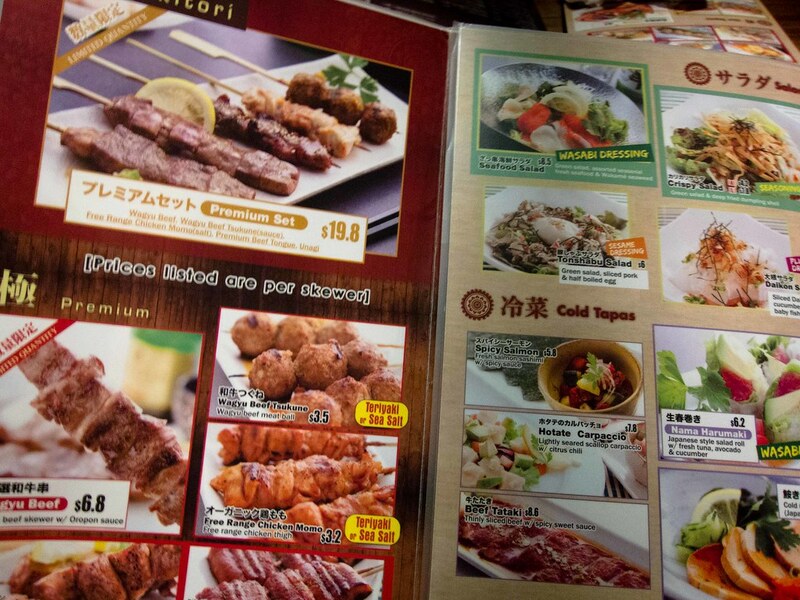 On top of skewers, we also tried the takoyaki, daikon salad, ankimo (monkfish liver), beef tataki, chicken karage, grilled mackerel, marinated mackerel and nama harumaki (salad roll). The daikon salad was great, very refreshing. The thin slices of daikon were paired with a savoury dressing. 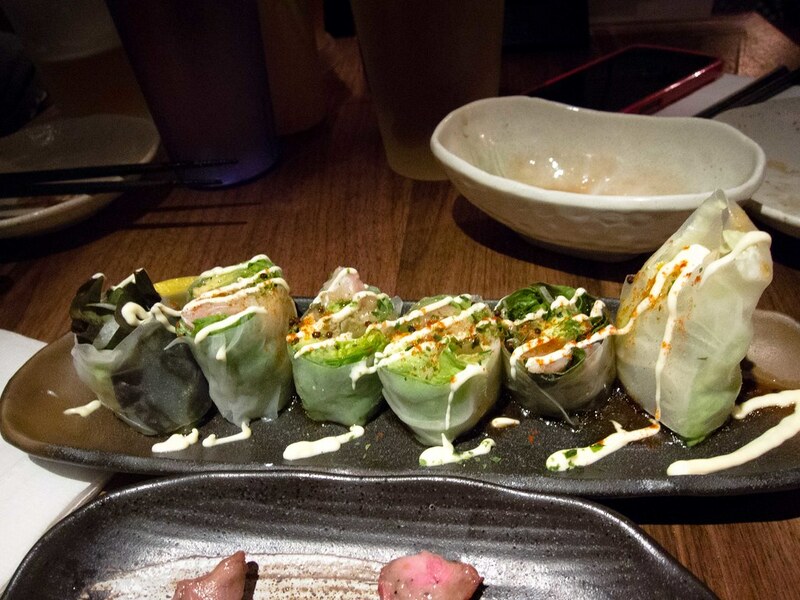 We also liked the ankimo and salad roll enough to order seconds. These were both cold dishes, and again very refreshing in contrast to all the grilled meat. The ankimo was a surprise hit at the table, with a spreadable texture and not overly fishy taste. 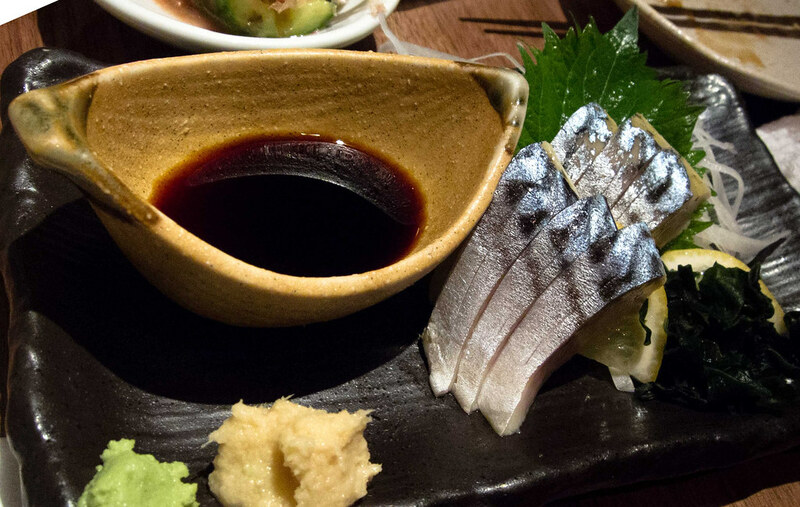 The grilled mackerel was slightly disappointing being under seasoned, while the marinated mackerel had a great acidity and firmness. 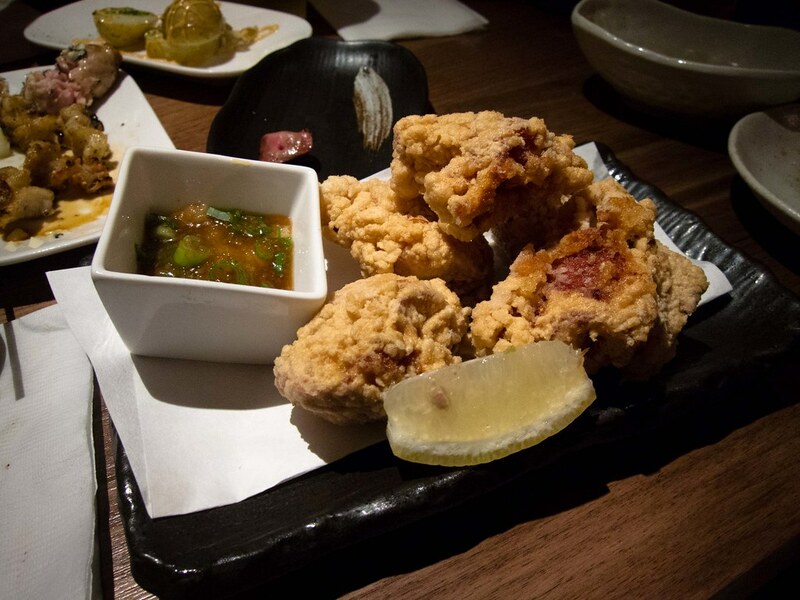 The chicken karaage was very tender and juicy on the inside with a good crispy batter shell. Then there was still room for dessert. We ordered three of the four available options to split at the table. 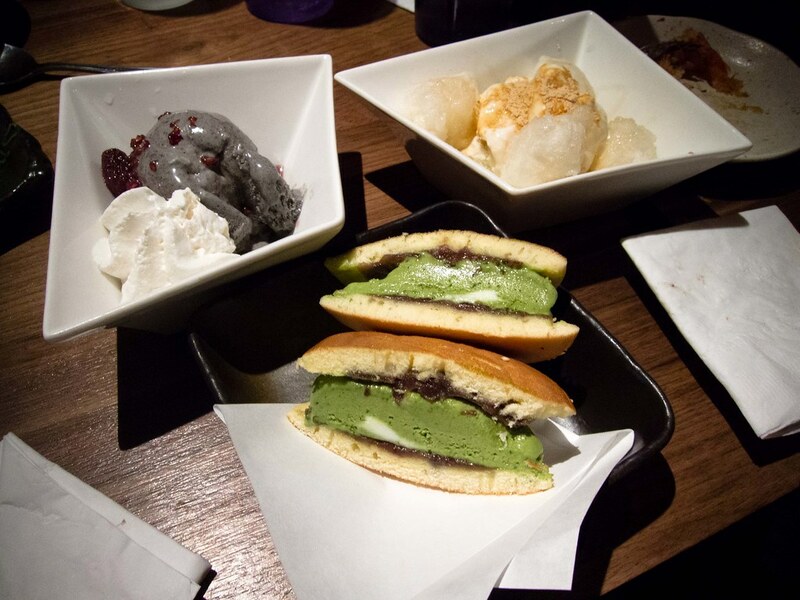 The kinako mochi ice cream (vanilla ice cream with mochi and maple syrup), dorayaki matcha ice cream (green tea ice cream with red bean in a Japanese pancake) and kuro goma ice cream (homemade black sesame ice cream). All of the desserts were amazing, sweet but not over the top, rich and creamy. My favourite was the black sesame followed closely by the vanilla mochi. Phew, I did say we ordered a lot of food! I had a great time at Zakkushi, the variety and breadth of the menu with so many dishes being outstanding will have me coming back for sure.